David Bernhardt is expected to be nominated as Interior's No. 2. Photo courtesy of Brownstein Hyatt Farber Schreck LLP. 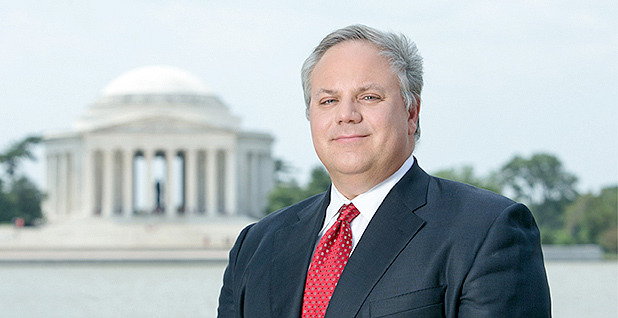 David Bernhardt, who served as the department's top attorney under Bush and worked on the Trump transition team, is the front-runner to become Interior's next deputy secretary, according to a source close to the Trump administration. Bernhardt is chairman of the natural resources department at the law firm Brownstein Hyatt Farber Schreck. He was in charge of Trump's Interior transition team for a short time after the November presidential election but was replaced as that team's leader later that month by Doug Domenech, another Bush-era Interior Department staffer (Greenwire, Nov. 21, 2016). Bernhardt served in several top jobs at Interior, working under secretaries Gale Norton and Dirk Kempthorne. Bernhardt was solicitor from 2006 until 2009 and deputy solicitor from 2005 until 2006. He also served as counselor and deputy chief of staff to Norton and as director of the Office of Congressional and Legislative Affairs. He also worked on Capitol Hill as legal counsel to the House Rules Committee and aide to former Rep. Scott McInnis (R-Colo.). Bernhardt has gone through the Senate confirmation process before. He was ultimately confirmed unanimously to be Interior's solicitor in 2006, although he faced some hurdles. Then-Sen. Jeff Bingaman (D-N.M.) said that year that he believed Bernhardt was not a good pick, claiming the nomination is "not in keeping with the level of qualifications most people would expect for the Interior solicitor" (E&E News PM, March 15, 2006). Sen. Ron Wyden (D-Ore.) then slowed down his confirmation with a procedural move, citing concerns about a rural schools grant program (E&E Daily, Sept. 11, 2006). If he's nominated and confirmed to be Interior's No. 2, Bernhardt will be tasked with offering Trump's Interior secretary-designee — Montana Republican Rep. Ryan Zinke — guidance about the inner workings of the department. Zinke hasn't previously worked in the department that oversees about 70,000 staff around the country. David Hayes, who previously served in the job during both the Obama and Clinton administrations, described the No. 2 post at Interior as "particularly important because only the secretary and the deputy secretary have statutory line authority and responsibility over the entirety of the sprawling Interior Department and the 10 major — and often culturally independent — bureaus that together make up the department's 70,000 employees." The deputy secretary is also "the department's chief operating officer, and his or her fingerprints typically are on every major policy and management decision made by the department," Hayes added.